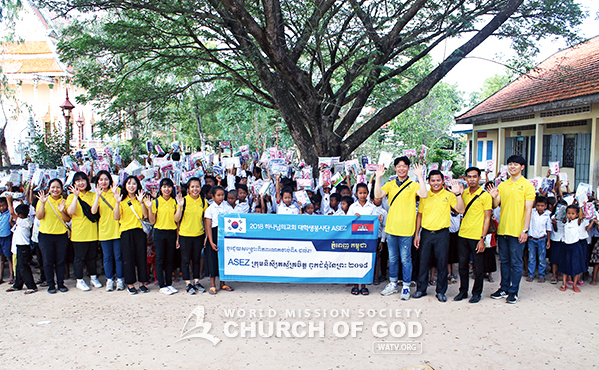 ASEZ University Student Volunteer Group donated school supplies and taught Korean alphabet at a primary school in Cambodia. The passion of young adults does not cool down even at -40℃ [-40℉], or wither at 40℃ [104℉]. ASEZ, the Church of God university student volunteer group making efforts to preserve the environment and raise people’s environmental awareness, continued its enthusiastic activities during the winter vacation. Between January and February, the students flew to 34 cities in 23 countries and proceeded with a variety of events to exchange cultures and enlarge their experiences. This time, their volunteer service was focused on the street cleanup to create Mother’s Street. Mothers keep every corner of their houses clean and tidy and make their homes warm and cozy. The Mother’s Street project is to regularly clean a distance of one kilometer that requires the improvement of the environment with a mother’s heart, and furthermore to make 40,000 kilometers [24,855 miles], the circumference of the earth, bright and clean. In Johannesburg, South Africa, and in Medan, Indonesia, they cleaned around university campuses in connection with local university students and citizens. In Ulaanbaatar, Mongolia, they removed snow and ice that were thick and frozen on the roadsides, and collected garbage and dirt beneath them. Local universities such as the University of Science and Technology in Meghalaya, India, held environmental seminars to make known the importance of preserving the environment. ASEZ’s street cleanup is one of overseas volunteer services to settle environmental protection cultures in local areas. A street cleanup doesn’t need fluent foreign language abilities or particular tools or skills, but can lead local people to participate in it and improve their awareness. Signing a Memorandum of Understanding [MOU] is also in the same context. ASEZ has established global partnership and footholds by signing MOUs that promise future cooperation with government agencies, public offices, local autonomous entities, and universities such as Trujillo City in Peru and the University of San Simón in Bolivia, so that street cleanups can be continued in the interest and support of governments and regional municipalities. The university students actively carried out volunteer services that local communities needed; they not only cleaned streets but also taught Korean alphabet and donated school supplies to primary school students. Several organizations, including Las Piñas City in the Philippines, were inspired by ASEZ’s activities and presented certificates of appreciation and citations, expressing their strong support. An institution even promised to remember the activities of ASEZ by establishing the Mother’s Street sign. Although something is too much for one person, it will be easy if it is done together. When many small helping hands gather, they will become a great power to change the world. ASEZ’s volunteer services to create a bright and warm world will continue in the new semester with our global neighbors.